This little schoolhouse was built in 1882, and was used as a school until 1936. When the community requested a teacher, the county said that if they built a school, they would pay the salary. Church services also took place in the schoolhouse; they also had a cemetery across the street. The desks and chalkboards that are on the walls are the same ones that were there when the school closed in the 1930's. The school housed students in grades 1-8. From mid-September until late October, anyone can visit the schoolhouse and get a taste of what it was like to go to school back then. The Park Service has a program for 3rd grade classes to go on field trips. while there, they will participate in activities such as a "Spellin' Bee" and Schoolyard Games. I have a faint memory of doing both of those things as a young girl. If you're visiting the Great Smoky National Park and are looking for something "off the beaten path", this would definitely fit the bill! All your posts are making me think we need to put a trip to see the inlaws on our calendar! Probably sometime this summer. I've never seen this place either. I'll have to mention this one to hubby too. He's already looked up Fontana Dam and we're planning a trip there. I'm loving learning about new places for us to explore in the Smoky's. 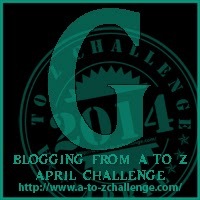 I love your A to Z topic!!! My favorite places in the world. I will be there next week and can't wait. Enjoying these posts. When we visited TGSM we took a guided hike and visited some places like this - not sure if it was this one or not. Loved it! Quite a contrast to our current schools. How wonderful that it is open to the public to experience. I'd love to be able to look inside! I think its neat too that they offer the program they do for the 3rd graders; a good comparison from school "then" to school "now".